The Japanese automaker unveiled the 2020 Toyota Tacoma in Chicago, and although it states the midsize pickup truck received “changes across the board,” it will take a keen eye to spot a 2020 model from previous model years. Changes to the Tacoma are in fact more than skin deep, although Toyota does mention that most versions boast a new grille design and new alloy wheels. Also: 2017 Toyota Tacoma TRD PRO: Where do You Want to Go Today? Inside, the truck benefits from a new infotainment system with seven- and eight-inch touchscreens—which replace the previous 6.1- and 7.0-inch units—as well as Android Auto and Apple CarPlay integration. The TRD Sport variant receives chromed taillight inserts and LED fog lamps, while LED daytime running lights and headlights are available as well. The intelligent key system now works for the front passenger door. In addition, Toyota is adding what it calls its Panoramic View Monitor, which provides a greater surrounding view of the truck during off-road treks. 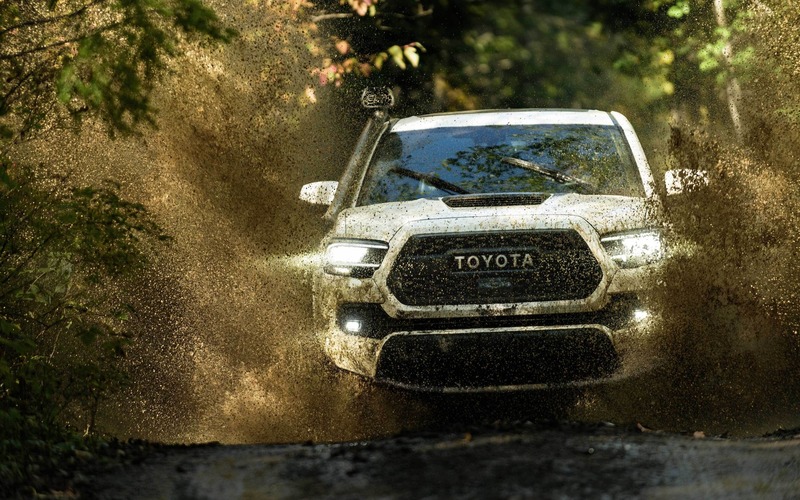 The TRD Off-Road version gets the TRD Sport’s cosmetic revisions and an optional Multi-terrain Monitor, which scans the surface under the vehicle. The Tacoma Limited gets the LED headlights and the Panoramic View Monitor as standard in addition to chromed tailpipes. The 2020 Toyota Tacoma TRD Pro benefits from new and lighter 16-inch wheels, revised Fox shock tuning, sequential LED headlights and black-insert taillights, while the aforementioned PVM and MTM systems are both standard. The Cavalry Blue paint is gone, replaced by the TRD Pro-exclusive Army Green, while Super White, Midnight Black Metallic and Magnetic Gray Metallic will also be available. The extreme off-road of the Tacoma also receives a new 10-way power driver’s seat and the eight-inch touchscreen. No changes for the two available powertrains, though. The 2020 Toyota Tacoma will continue to offer the 159-horsepower, 2.7-litre four-cylinder engine and the 278-hp, 3.5-litre V6. Both are matched to a six-speed automatic transmission, although the V6 can also be connected to a six-speed manual. Pricing and arrival date will be announced later. 2017 Toyota Tacoma TRD PRO: Where do You Want to Go Today?